Some foreign citizens who have been studying or working in Russia usually start thinking about getting Russian citizenship. I should notice that is not easy. There are three steps to citizenship: Temporary Residence Permit - Residence permit - Citizeship. 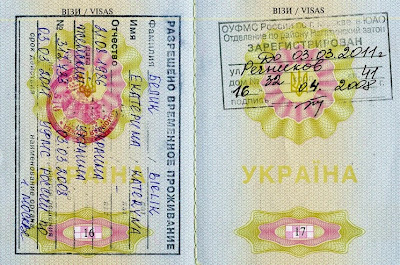 Temporary Residence Permit (raz-re-she-nie na vre-men-noe pro-zhi-va-nie or RVP in Russian) is a first step in getting Russian citizenship. A holder of RVP receives most of the rights which Russian citizens have. Which advantages RVP holders have? Firstly, they can work without any permission document. But I have to notice: this right covers up only that area, where RVP has been received. For example, you are not allowed to work in Moscow if you received RVP in Saint-Petersburg. Also, you can live in Russia for 3 years (RVP is valid for 3 years) without leaving it, because RVP gives you permission for 3 years-visa. So you don’t need to issue new one every 90 days, like you did before. You can also freely leave Russia for vacation, business or meetings with family, but no longer than for 6 months in year - a longer period may cause RVP cancellation. Opportunity to get a free medical insurance policy is also a useful addition, just like paid time off and maternity leave. There are some disadvantages, too, for example, you are not allowed to work in police services, Federal services etc. Also you don’t have rights for voting and be elected. You think that you need a RVP? Here you go. If no one condition from lucky list above is about you, seems that you have to get a quota firstly. It is a kind of competition among persons, who are interested in getting a quota. You have to prove Migration Service (FMS) why they should choose you. It is almost impossible to get a quota in cities like Moscow and Saint-Petersburg because of large number of applicants. Biggest opportunity for getting is in the Jan and Feb. If you are the lucky one and have a condition from list above, you don’t need to get a quota. You can skip the previous step and start gathering documents for the RVP. - Certificate of proficiency in Russian, knowledge of the history of Russia and the legal framework of the Russian Federation. You would get it after passing an exam. You don’t have to get it, if you have been studying in Russian university or school – in that case you’ll have to show FMS worker your diploma. - Certificate of medical examination, to prove that you are healthy. - Your visa and it’s copy. - Your migration card and it’s copy. - Your migration registration ticket and it’s copy. Is you are the one from lucky list, you will have to add some documents like marriage certificate if you have a Russian husband or your birth certificate if you were born in Russia. After the FMS employee would accept the documents, you’ll have to wait 6 months for your case decision. You don’t have permission to stay in Russia while waiting for decision if your visa has been ended, so you have to leave before it ends. After you get a decision letter with positive result, you have to show it to Russian embassy and apply for a special visa. With that visa you can go to Russia and get your RVP. After you get RVP you have to put a registration stamp to your pass. In that stamp there is an address where you should live for those 3 years. Then you have to make a 3-years visa, if you haven't got it at the embassy. After 1 year living with RVP you’ll have to confirm it. For that you’ll need a income statement. NB! You are not allowed to extend your RVP. Start getting Residence permit (vid na zhi-tel-stvo) before RVP ends. We are enjoyed this post. It is really best for those who want to apply to the residency personal statement editing service because it is just amazing..
Hello, Thank you for good information. Do you have idea about language-history-legal framework certificate? can you give some examples, or courses about it? and "After 1 year living with RVP you’ll have to confirm it. For that you’ll need a income statement." How much rubles it must be for Spb? do you know ? Thank you. How would you have to show on your income statement if you are registered out of Moscow (Podolsk)?